Walter K. Crook, 78, of David City, formerly of Rising City, died Tuesday, March 13, 2018 at the Butler County Community Health Care Center in David City. Walter was born on Nov. 6, 1939, at Columbus, NE. He was the son of H. Keith and Gladys (Pool) Crook. He attended and graduated from Rising City Public Schools in 1957. On January 11th, 1958, he married Mary Ann Vavra and to this union four children were born. Michael, Diane, Bruce and Denise. Walter and Mary Ann moved to the Walter Pool farm in April 1958 and lived there for 51 years and then moved to Rising City in 2009. During his lifetime, Walter worked at Behlen Manufacturing for a brief time and then returned to the farm and raised hogs and farmed with his father, Keith, for many years, along with his sons Mike and Bruce. Walter and Mary Ann co-owned the Rising City Dairy Queen for the Rising City community members to enjoy. Walter also co-owned WMB Ag Sales for 15 years and, along with his wife, Mary Ann, owned and managed Crook Addition Apartments from 1978-2002 and was instrumental in helping to develop the north edge of Rising City. In 1992, Walter was hired by Polk-Butler Mutual Insurance Company to be the CEO and retired in 2013 after 21 years of service. He was on the Nebraska Re-Insurance Board for many years and held many offices and ended in 2012 as their President. He was also on the State Association of Mutual Insurance Companies for 21 years and was on the executive board and held many offices and finished as President. In 1991, Walter was elected to the Butler County Public Power Board of Directors and served for 26 years and retired in January 2017. During his time on the board he served as chairman for two terms totaling eight years. Walt served on the Building Committee when Butler PPD built their new facility in David City, and was extremely proud of the project and completion of the beautiful facility for Butler PPD. Walter was elected by the Nebraska Public Power Association to be on the board of National Rural Utilities Cooperative Finance Corporation (CFC) in Washington, D.C. He served the customers in Nebraska, Kansas, Colorado and Wyoming. He served on that board for six years and retired in 2015. Walter was involved in bringing Nebraska Rural TV to Butler and Seward County. He was chairman of the board of Nebraska Rural TV for ten years. Walter helped organize the Seward/Butler Pork Producers with his fellow hog-producing friends and he served as the first President for that organization. Four years later the group dissolved and he became the first President of the Butler County Pork Producers. 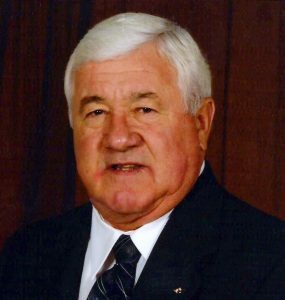 He served six years on the State Pork Producers Association as its First Vice President. He was also a national convention delegate for six years. Walter was very active in the Rising City Ball Program and was instrumental, along with some other community members, to move the ballfield in the early 1970’s to the location where it stands today in Rising City. He was a girls’ softball coach and an umpire for many games. One of Walter’s strongest passions was 4-H. He was involved in 4-H throughout his childhood years showing cattle and hogs, and that led to him being a 4-H leader for his children and Rising City Livestock Club. Walter, and his wife, Mary Ann, never missed going to the Butler County Fair, or never missed any of their children’s or grandchildren’s 4-H events. They were one of the strongest supporters of the new Butler County Event Center at the fairgrounds in David City that was completed in 2017. Walter was a Master Mason in Fidelity Lodge No. 51, David City, NE and received his 50 year pin in 2016, and was a member of the Sesostris Shriners and Pawnee Shrine Motor Corp. where he traveled to many parades across the Midwest and participated in parades and also competed on obstacle courses. Their group won many awards for their riding skills. He also was a member of the Scottish Rite of Freemasonry since 1975. In Walter’s free time, he loved the outdoors, farm life and especially enjoyed gardening along with his pride for his asparagus patch and yearly sweet corn patch. Walter was an extreme sports enthusiast and loved going to Husker football games, and could be found many nights watching or listening to Husker volleyball, basketball or baseball games on the radio or TV. Walter was extremely proud of his children and enjoyed spending time with his grandchildren and great grandchildren along with attending their school and sporting events and 4-H activities while they were growing up. He is remembered by his three children and spouses, Michael Crook of Rising City, NE; Diane (Jeffrey) Duren of Rising City, NE; Denise (Doug) Tonniges of Gresham, NE. Grandchildren are Daryl Crook, Rising City, NE; Holly Crook, Milford, NE; Shauna (Sam) Soulliere, Lincoln, NE; Joni (John) Crumrine, Lincoln, NE; Audra Duren, Chicago, IL: Stephanie Laska (Nathan), Duncan, NE; Janice (Grant) Swenson, Des Moines, IA; Heather Kucera (Kevin), Cedar Bluffs, NE; Sheila (Allen) Stanek, Valparaiso, NE; Kayla Kilgore, Gresham, NE; Eric Tonniges, Gresham, NE; Amber Tonniges, Gresham, NE. Great-grandchildren are Quinn Soulliere, Cameron Soulliere, Ellie Ann Crumrine, Avery Lee Crumrine, Hudson Swenson and Brennon Swenson. Siblings are Alton Crook, Fremont, NE; along with brother-in-law Paul Vavra, Rising City, NE; sister-in-law Helen Prochaska, Ulysses, NE; sister-in-law Dorothy (Ronald) Ruth, Rising City, NE; sister-in-law Maxine Reinke, Columbus, NE; sister-in-law Doris (Randy) Henderson, Maricopa, AZ, daughter –in-law Linda (Terry) Bartunek, of Bruno, NE; special friend Marilyn Sanderson, and many nieces and nephews; family and friends. Walter was preceded in death by his parents, his wife, Mary Ann of 58 years in 2016; son Bruce Keith Crook in 1992; father-in-law Frank J. Vavra, mother-in-law Rosie L (Konrad) Vavra, sister-in-law Lois Crook and brother-in-law Ray Prochaska, Sr.
Memorials may be directed to the wishes of the family. Arrangements by Kracl Funeral Home of David City. Condolences may be sent to http://www.revbluejeans.com.